The pre and post party has got Pitbull written all over it. 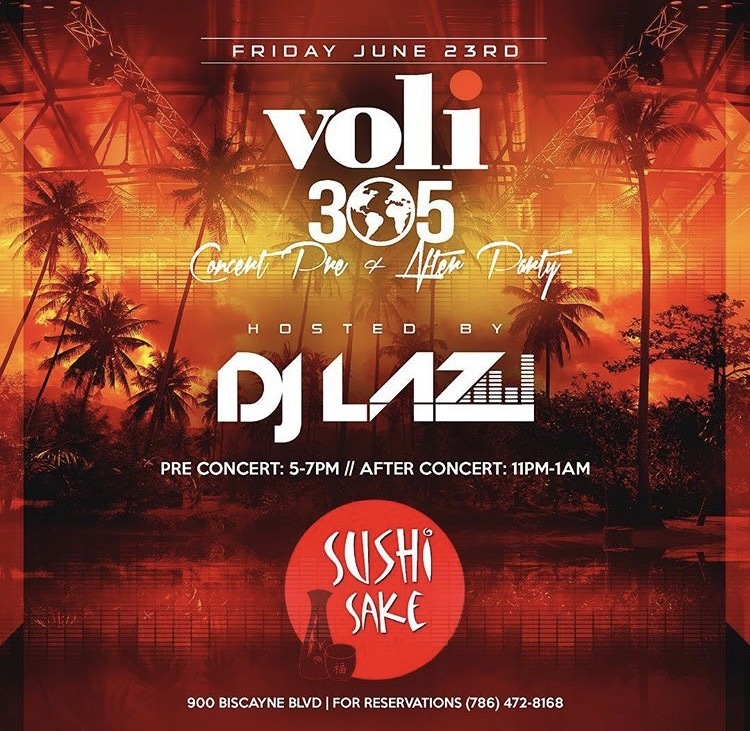 Not only does it have Pitbull’s Uncle on the decks but the event is also sponsored by Mr305-Worldwide’s Voli Vodka 305 which means that you can get a good mix of drinks made from this unique ‘305-grown’ vodka - iLov that! 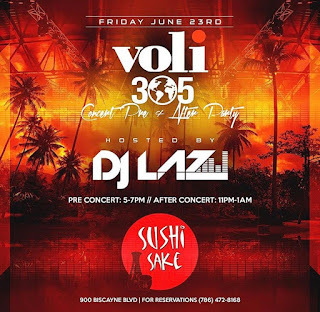 Endless Voli Vodka flowing, you have DJ Laz THE BEST RADIO PERSONALITY FOR BEST OF MIAMI 2017 (The Miami New Times), Voli and good food. What’s there to think about. ‘Don’t Stop The Party’ Dale! Attention all Pitbull and Enrique Iglesias fans! Are you going to the 'PitRique' concert on June 23rd Miami, American Airlines Arena? 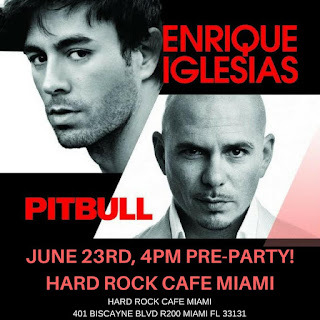 Hard Rock Cafe Miami are holding their very own pre-concert party. Take advantage of the SPECIAL one off 25% discount to purchase the Hard Rock Heals Mr World Wide Signature Series collection FOR THIS DAY ONLY. 15% of each T-shirt purchased goes towards the SLAM Foundation to re-engage a new generation of kids into education. Do your bit for education with 'Mr Education' and get your discounted Mr World Wide Tee! 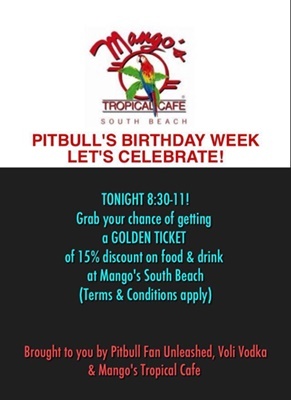 As Pitbull says 'Don't Stop The Party' so let's START the party at Hard Rock Miami, have fun and help make a difference towards education with SLAM. Details as below. Dale! Congratulations to Pitbull who was awarded the first ever Songwriter’s Hall of Fame Global Ambassador Award. An award not given out lightly or as often but to those who have earned a "true worldwide appeal, crossing genre, cultural and national boundaries". Pitbull has done all of these. Crossed countless genres that his music fits into so easily, bringing different genres together in one song, connecting rhymes and music that speaks to the globe (and not just the street or block) regardless of culture and breaking through language barriers. With that said, in a nutshell capturing a wider audience and global appeal. There is so much DEPTH, truth, fun, word-play, innuendos, links from one phrase to another and double-meanings that your ears and mind have to be fully open to catch in Pitbull’s writing in a blink. There are just far too many favourites to highlight. I never listened to lyrics until I met Pitbull’s rhymes, and I have told him that too. The day I discovered CULO video and the M.I.A.M.I album is etched into my with memory with vivid visuals like it was yesterday. As I continue to tell and educate my friends still today. It’s not just the party, girls with a signature ‘Dale’ and the more commercial and wider audience chart money-spinner songs you need to listen to. Dig deep. Deeper into many other songs. There is a message that resonates with all. Pitbull’s lyrics for me personally has had a positive effect and lifted me out dealing with a personal tragedy by giving an escape, hope and positive mind set, drive and direction since. As with many other fans out there. With the vision “It’s all about the global movement. It being a global market. Making global music”, Pitbull did make that ‘big splash then the ripple effect’ all across the world. Pitbull plays and reaches ‘across the world’ and changes the ‘Climate’ in music time after time. They don’t call him Mr Worldwide for nothing…he earned that…. Very much deserved! Congratulations and thank you Pitbull for the inspirational, motivational, uplifting, fun messages in your song writing. From the ones that stop me in my tracks to think to the ones that make me chuckle out loud.